- User settings must be retained between sessions. - All of the users must be assigned their own virtual desktop. - Group Policies linked to the Sydney office OU must apply to all of the virtual desktops that are used by the Sydney office users. A. Create a new managed personal virtual desktop collection. B. Link a Group Policy object (GPO) to the Sydney office OU and specify the User Rights Assignment settings. C. Create a new managed pooled virtual desktop collection. D. Link a Group Policy object (GPO) to the Sydney office OU and specify the Restricted Groups settings. According to Microsoft "Personal virtual desktops are permanently assigned to a user account and the user logs on to the same virtual desktop each time." What is a personal virtual desktop? - A personal virtual desktop is a virtual machine hosted on a Remote Desktop Virtualization Host (RD Virtualization Host) server and assigned to a user. Unlike a virtual desktop pool, where a virtual machine can be configured to rollback the changes when a user logs off, a personal virtual desktop retains all changes made by the user. How do you assign a personal virtual desktop? - The Remote Desktop Connection Broker Manager (RD Connection Broker Manager) can be used to assign an unassigned virtual machine to a user. The assignment is stored in Active Directory. The assignment stays intact even after the user logs off from his or her assigned personal virtual desktop. An administrator can reassign a personal virtual desktop or make changes to the assignment through RD Connection Broker Manager. Your network contains an Active Directory domain named contoso.com. The domain contains a Virtual Desktop Infrastructure (VDI). The VDI contains four servers. The servers are configured as shown in the following table. You need to recommend a solution to track the amount of time required to create virtual desktops. A. 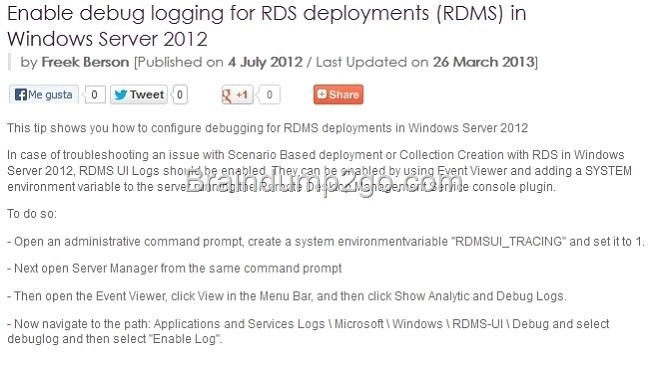 From Event Viewer on Server2, enable Analytic and debug logging. B. From Event Viewer on Server1, enable Analytic and debug logging. C. From Group Policy Object Editor on Server2, configure the Advanced Audit Policy. D. From Group Policy Object Editor on Server1, configure the Advanced Audit Policy. - Only updates approved by the administrator in the main office must be installed on client computers in the branch office. - The local administrator in the branch office must not be able to approve updates. - Bandwidth usage between the offices must be minimized. A. Configure Server2 as a downstream server in autonomous mode. then set the approvals to Automatic. C. On Server1, configure a client computer group that contains Server2, and then set the approvals to Automatic. D. Configure Server2 as a downstream server in replica mode. Your network contains an Active Directory domain named contoso.com. 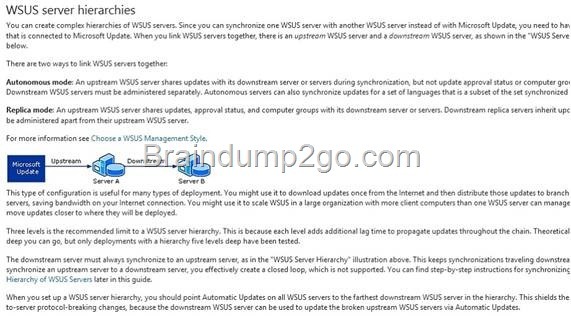 The domain contains two servers named Server1 and Server2 that have the Windows Deployment Services server role installed. You use Windows Deployment Services (WDS) to deploy operating systems to client computers. Server1 contains two boot images and two install images of Windows 8. You copy the images to the appropriate WDS image folders on Server2. You need to ensure that you can use the images on Server2 to install the client computers. What should you do on Server2? A. Run wdsutil.exe and specify the /bcdrefreshpolicy parameter. B. Run bcdboot.exe and specify the /addlast parameter. C. Run wdsutil.exe and specify the /resetbootprogram parameter. D. Run bcdboot.exe and specify the fm parameter. "The boot selection failed because a required device is inaccessible." (0xc000000f). This is because the server must be regenerate the corresponding BCD before a client can receive a boot image from the server. Your network contains an Active Directory domain named contoso.com. The domain contains a server named Server1 that has the Windows Deployment Services server role installed. Server1 hosts a single install image of Windows 8 (x64) and 200 driver groups. Each driver group has a different set of filters configured. You are preparing to deploy windows 8 to a new hardware model. You need to recommend a solution to identify which drivers from the existing driver groups will be deployed to the new hardware model. What should you do first? A. Create a prestaged device. B. Create a capture image. C. Install Microsoft Deployment Toolkit (MDT) 2012. D. Install the Microsoft Assessment and Planning (MAP) Toolkit. The Expected Deployment Results Wizard is a new feature in Windows 2012 Server WDS,which allows administrators to view deployment information - such as the set of matching driver groups that would be sent to a prestaged device. It enables administrators to model the process of deploying a computer and seeing what boot images, install images, driver groups the computer will be offered from the server. It is designed to help administrators efficiently test configuration changes to their servers and see how they impact deployments to all or specific (prestaged) computers. The tool is especially valuable when used to test some of the advanced configuration options afforded by the WDS infrastructure for custom deployments. Your network contains an Active Directory domain named contoso.com. The domain contains a file server named Server1. Server1 contains a shared folder named Share1. The domain has Microsoft System Center 2012 Configuration Manager deployed. All client computers run Windows 7. You plan to upgrade all of the client computers in the marketing department to Windows 8. 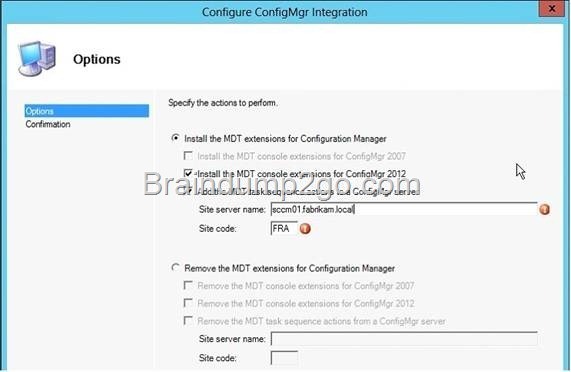 You will migrate the user settings by using the User State Migration Tool (USMT). You need to capture the user state on each client computer. The solution must exclude offline files from the captured data. Which three actions should you perform? Your network contains an Active Directory domain named contoso.com. The domain contains a server named Server1 that has Microsoft System Center 2012 Configuration Manager installed. All client computers run Windows 7. You plan to deploy Windows 8 to all of the client computers. You discover that the Client Replace Task Sequence task sequence is unavailable from the Configuration Manager console. You need to ensure that the Client Replace Task Sequence task sequence is available from Configuration Manager. What should you install on Server1? - Each computer must be able to download the image from a server in the local office. - User interaction during the deployment must not be required. - You must be able to deploy the images after business hours. Services (WDS) server in each office. Your network contains an Active Directory domain named contoso.com. The domain contains a server named Server1 that has Microsoft System Center 2012 Configuration Manager installed. Configuration Manager has all of the system roles enabled. The domain contains 500 client computers that run Windows XP. You need to install Windows 8 on all of the client computers by running a full installation from a Configuration Manager task sequence. - All user state data must be copied to a secure network location before the installation of Windows 8. - All user state data must be retained on the network after the installation of Windows 8. Which five actions should you include in the task sequence? To answer, move the five appropriate actions from the list of actions to the answer area and arrange them in the correct order. Your network contains an Active Directory domain named contoso.com. You have 20 secure client computers that do not have DVD drives or USB ports. The client computers run Windows XP and use an application named Appl. App1 only runs on Windows XP. The client computers have multiple partitions. You need to configure the client computers to dual-boot between Windows XP and Windows 8. You copy the Windows 8 source files to a network share. What should you do next from the network share? A. Copy Install.wim to the local hard disk drive, and then run bcdedit.exe. B. Copy Boot.wim to the local hard disk drive, and then run bcdboot.exe.